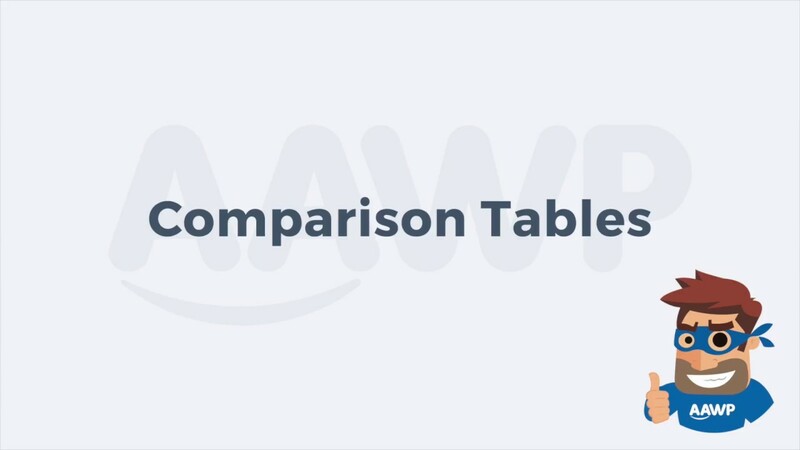 To create a comparison table, you need at least 2 products, which can be compared with each other. The creation of the table is really simple and can be performed directly via the WordPress admin area. Products can be added easily by using the article number (ASIN). Here you can find our article which shows you how to find the ASIN of a product. Only one ASIN respectively product can be added at once. By entering a search term, the plugin finds relevant products which can be selected and added to the comparison table. The order of rows can be changed and the new order will be applied to all products automatically. By hitting the green button, a row can be deactivated and hidden for site visitors. The label of a row shows up on the left side of the table. Entering a text is optional. Depending on the content type, more options show up. We’re going to continuously add more content types. Rows can be highlighted by adding a background color. The color can be selected on the plugin settings page (tab “functions”, section “comparison tables”). If you wish, you can easily add a link (referencing to the product detail page at Amazon) to the output of the selected row. In case you don’t need a row any more, feel free to delete it by using the corresponding icon. In general you don’t need to make any deeper product configurations for a basic comparison table. Nonetheless there are more options which can be used to adjust the product. By hitting the green button, a product can be deactivated and hidden for site visitors. You can easily change the product by entering a new ASIN. By using the product search, you can easily search a new product and replace the current one. Each row will be assigned to a content type by default. Additionally you can overwrite the pre-assigned content type for each row respectively product. Here you can blend in more options (e.g. highlighting a product) to customize the output of a product. Products can be highlighted by adding a background color. By using the color picker, the choice of the color is yours. Entering a text (e.g. “best choice” or “best price”) is optional. Highlighting a product can be activated/deactivated by using the icon on the left. In case you don’t need a product any more, feel free to delete it by using the corresponding icon. For optimal presentation, a wide page template should be used depending on the number of products placed. Right now, comparison tables cannot be copied/duplicated yet. This functionality is already on our todo list and will be implemented soon. Anyway we recommend using the plugin “Duplicate Page” which allows duplicating existing tables. Is there a WooCommerce integration?